As a new participant and current leader for the Yellow jersey, Robert and I had been discussing strategy over dinner the previous night. For some reason I thought he had an unassailable lead of two hours over me while he was insisting it was only an hour (turns out he was right). Neither of us realized that Nick was actually in second place, ahead of me by 10min. Robert wasn't particularly trusting of my advice, especially since I would always frame it around jokes and smiled a lot, and he was never sure if I was sincere or trying to mess with him. In fact I was always telling the truth (and told him I was), though I admit to taking pleasure in his doubts, doing little to dispel them. The best advice I had given him was that with the lead, all he had to do was stick with whomever was in second place and he couldn't lose. This has a big advantage if one isn't sure about route-finding and might not be sure which way to go or whom to follow. Robert would ignore this sage council and pay for it today. We had 14 at the trailhead for an unusually late start of 6:08a, though no tardy slip were issued (time was actually started back at the parking lot, not at the TH since car-to-car time is really what we're after). Much of the first hour was plodding the forested trail up from North Lake Campground, climbing about 1,600ft in a little less than three miles to Lower Lamarck Lake. By this time our line of participants had spread out some with Robert and Rob, the previous day's stage winners, less than a minute ahead of Tom and I. Neither of the two had ever been over Lamarck Col and consequently were unsure where to leave the Lamarck Lakes Trail to find the unmarked use trail to Lamarck Col. On the other hand, Tom and I had been over Lamarck Col more than a dozen times between us, more than a few times in the dark. Tom was immediately in front of me, talking about something I've long forgotten, when I noticed Robert and Rob stopped in the trail a short distance ahead of us near the turnoff, consulting their map. Without saying a word to Tom, I made a sharp turn off the trail and struck off uphill. I must have made noise because the other two turned to see me just as I disappeared. Tom walked passed them on the trail, saying "The turnoff's just up here." This was a bit disconcerting and they didn't know who to follow. Two minutes later Tom and I had rejoined above on the use trail - there's more than one way to reach it - and looked at each other, wondering where the other two were. "I thought they were following you?" We got a chuckle out of this, curious as to how they could have missed following both of us but of course did nothing to help them find their way. They're big boys, after all. Tom and I (soon joined by Sean) continued up the Lamarck Col Trail, climbing above Lamarck Lakes, up a series of steep switchbacks (the trail was official and maintained at one time as evidenced by this well-constructed part of the trail), and into the adjacent drainage. It appeared we were in front at this time and we kept up a strong pace to ensure it stayed that way. We continued on the easy-to-follow trail for almost an hour until we were less than half a mile from Lamarck Col. We could see that the route up to the col was unusually snow-free, with only a section of dirty ice on the far right side of the col - as dry as either of us had ever seen it. We turned left here, leaving the trail to climb up granite boulders and broken rock that characterized the ridgeline atop which our peak sat. We had actually overshot the turnoff because it wasn't clear from below just where the summit was, and it was only after reaching the ridgeline and a false summit that our small error was evident. 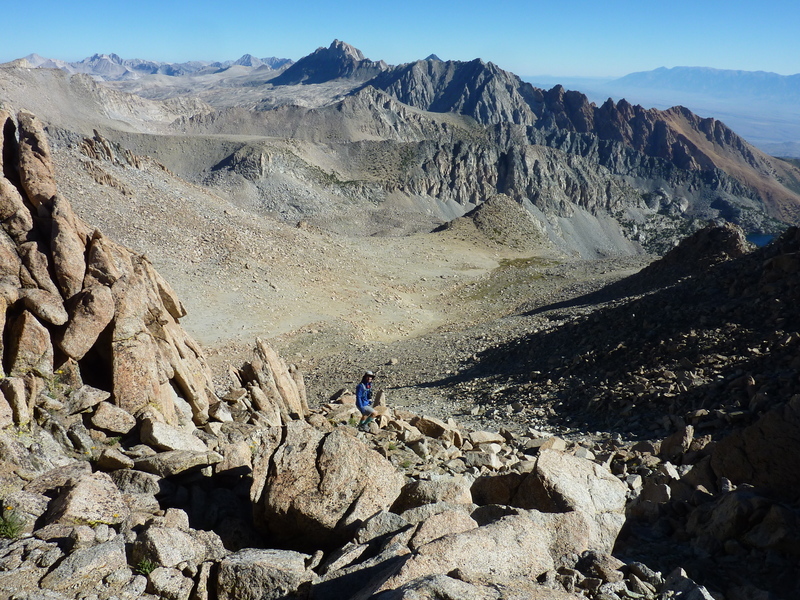 It mattered little in the end, as we found our way to the summit by 8:30a. It was windy and quite cold and the first thing we did was dig into our packs for whatever remaining clothes we could find that we weren't already wearing. Carl Heller and Dennis Burges (still alive and living in Ridgecrest) had left a register of loose pages in 1971 with a more organized notepad a decade later. The summit sees one or two parties a year judging from the recorded entries on the 25 pages or so. It's probably a great summit to take in views of the Evolution area and the Bishop Creek drainages, but it was too damn cold this morning to appreciate much of it. Sean rejoined us after about ten minutes dressed as a ninja in his own effort to ward off the cold. We took a summit photo of the three of us and started down before our lowering heart rates would have a chance to drive down our body temperatures with them. We descended more directly off the north, finding the route back to the trail both faster and easier than our ascent route. Just above us on the trail was Jeff Moffat (who had climbed this very peak during the Challenge two years earlier) and we shouted up to say hello. Just below us on the trail, were Rob and Robert. We greeted them with feigned surprise and had a fine laugh at their expense. They told us of their misadventure and getting lost in the wrong drainage for much of an hour before finding their way. The wisdom of my advice the night before was now very obvious to Robert and he castigated himself for foolishly ignoring it. He wanted to know what our time was at the summit so as to be able to judge how far they were behind us. I made his calculation much easier by simply responding that they were an hour behind. This was was pretty much the entire lead he had built up over the first four days and he was determined not to lose more. We bid goodbye and went off in opposite directions. Nick had failed to show up to the TH today, dropping him from his second place standing for the Yellow jersey. I was able to cut Robert's first place lead to 15min and from this point on it was a two horse race. A number of participants had gone to Mt. Lamarck after Lamarck Col Peak. Chris and Michael tagged both of these plus Lamarck North (Peak 13,464ft) to further distance themselves in the lead for the Polka Dot Jersey. The other two jerseys had no real competition this year - Eric was the only one under 25yrs eligible for the White jersey and I had a commanding lead among the over 50 crowd and the Green jersey that would only be challenged if I failed to reach a peak on one of the remaining days.